About 14 years ago I started to knit a blanket from left over yarns. Like other badly planned projects, also this one came to a halt when I got out of red yarn in that particular shade and weight. So I put it away and thought I’d buy more one day. And forgot all about it. I found the blanket when I moved my spinning, knitting, crochet etc into my new room some years ago. And I still didn’t have that red yarn, so I put it on a shelf to wait for better times. It took a while for me to realise I do have more of that yarn! I had bought it for a crochet project, but had forgotten all about the afghan. One day this January, while waiting for the cold to leave my head and let me think again, I saw it! And I finished the blanket. It’s big enough for hubby’s afternoon nap. The technique is domino knitting the way Vivian Høxbro teaches it. Here’s a link to her Danish site, where you can change to English. But do look at the photos in the Danish version first! She doesn’t teach very much anymore, but if she happens to come somewhere near you, don’t hesitate! She’s a strong Nordic woman with much integrity, a big laugh, colourful clothing, and great knowledge about colours and design. Domino knitting is one of my favourite techniques. It’s perfect for left over yarns. It’s also perfect for many big projects, as you knit one small square at a time, then attach it by knitting the next one onto it like a Domino play. You don’t have to hold the whole heavy project in your hands, only that small square. Good for your hands, good for your mind as you can knit a square within half an hour, and feel as if you’ve finished something. January 31, 2016 - 1:26 pm Marilyn F.
What a nice project you have finished. 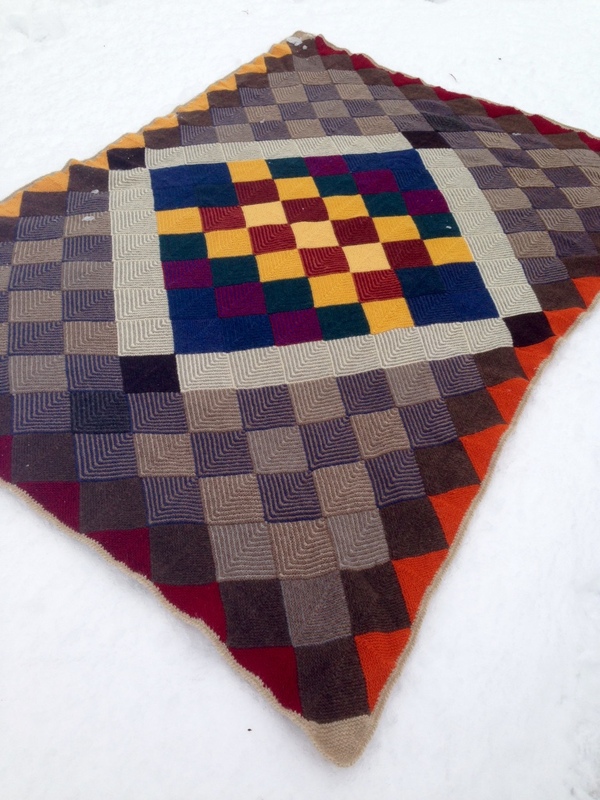 It really looks like an old fashioned handsewn patchwork quilt – luv that look. I have not done any domino knitting. This may just inspire me. You make it sound like fun. Thanks! Toivoa siis on 🙂 Siitä vain! WOW, great finish! My sister has knitted with Vixbro’s patterns and liked them a lot. They didn’t call my name but…you never know! Such a beautiful blanket. I really like the Domino technique, so much so that I knitted a jacket in that technique a few years ago. I just sewed all the little squares together to make the shape. I’ve made sweaters and cardigans also!